Greenland was deglaciated for extended periods during the Pleistocene epoch (from 2.6 million years ago to 11,700 years ago), says a study published last week in Nature. The findings were based on new measurements of beryllium and aluminium isotopes (10Be and 26Al) in a bedrock core taken beneath the Greenland Ice Sheet summit. Such isotopes are introduced by cosmic rays. Models indicate that when this bedrock site is ice-free, any remaining ice is concentrated in the eastern Greenland highlands, with the Greenland Ice Sheet reduced to less than ten per cent of its current volume. The longest period of stability of the present ice sheet consistent with the new measurements is 1.1 million years, say the study’s authors. This was preceded, they believe, by more than 280,000 years of ice-free conditions. Future simulations of the Greenland Ice Sheet should take these nearly ice-free extended periods into consideration, the authors conclude. If the Greenland Ice Sheet should melt, the authors warn, global sea level could rise about 24.25 feet (7.4 m)1. 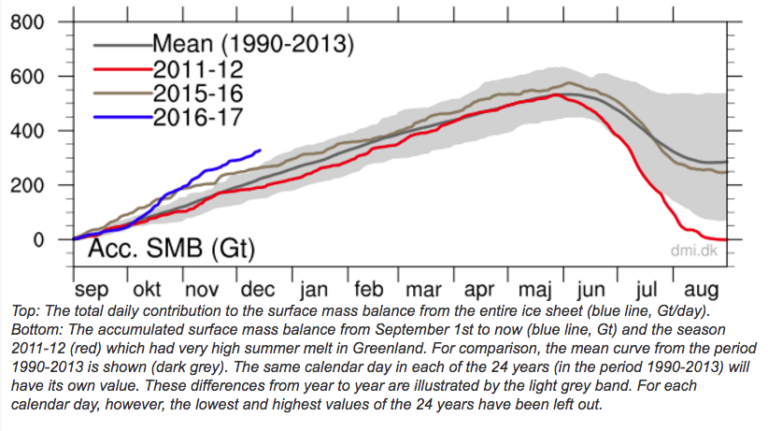 Note: I think the Greenland Ice Sheet is about to experience a very strong period of growth, leading to declining sea levels. In fact, I think that period of growth may have already begun. Likewise, the claims about Greenland are exactly opposite of the truth. Greenland is blowing away all records for ice growth this year. In case nobody has noticed, lately there has been a consistent meridional flow of warm moist air northwards over the central Atlantic from 30 degrees to 80 degrees N.
Warm arctic conditions and high snowfalls have preceded pretty much every European climate minimum over the millenia as evidenced in multiple southern Greenland 10Be glacier advance/retreat studies. The activity at the 850 hPa level is truly something to behold. If you click on “Earth” you can then change the setting parameters for temperature, humidty, elevation etc. It will also show you in real time what happening around the world in real time if you click the “sfc” setting for surface temps. Thanks for the link, Edward. Cool stuff. Your are more than welcome. 1) Increased snowfall on land leads to increased albedo in spring until such time as the snow doesn’t melt off in summer. 2) Remnants of the continental Laurentide ice sheet (Penny and Barnes Ice caps on Baffin Island) begin to grow. 3) Sea ice thickness and coverage actually DECREASES due to both the warmer temperature AND the insulative effect of the snow covering. 4) Increased planetary heat loss into space due to the thinner atmosphere over the poles and the higher temperature differentials. I take everything with a grain a of salt when I hear “the experts” tell me what something was like 100 years ago never mind 100,000 years ago. Unlike the AGW Ologists fraudsters who have never peer reviewed, their data or models, proxy records such as “new measurements of beryllium and aluminium isotopes (10Be and 26Al) in a bedrock core taken beneath the Greenland Ice Sheet summit. Such isotopes are introduced by cosmic rays”, are peer reviewed by accepted scientific processes which are reproducible in other areas of the world. The isotopes are datable in the same manner as dating fossil records via C14. Established scientific hard facts, Unlike the climate consensus, the so called magic agreement of 97% of all scientists, according to the IPCC and MSM, when in fact, the percentage is a statistical number made up out of the 67 Climate Ologists who answered favourably to four climate questions in a biased, rigged poll. Every one of the 67 has had, his or her, head deep in the money trough of AWG, gorging on the slush fund of AGW, now renamed as Human Induced Climate change, shortened even further by the IPCC to Climate Change. All of that effort to bolster and continue the fraud of Carbon Credits, and to support the Green Socialists who want a World Government dictatorship to curtail human development and eventually shrink the world human population to several hundred million or less. The AGW pantomime will run and run, breaking all political performance records, only they are fighting the Solar Energy Tide, forgetting the lesion of King Canute, time and tide wait for no man. Reminds me of that nonsense about the so-called “Paleolithic” diet… people naively claiming to eat like “their ancestors” ,,, but have no idea what the real Paleolithic was like and don;t listen to what archeologists tell them, based on analyzing poo. Which is that people then would eat anything that was eatable that they could find and catch, pick or dig up… be it fish, fowl, meat, plant… or bugs! Not just meat. And certainly not any kind of so-called “Paleo cake” which some of my silly Millennial coworkers brought in to share. Chocolate and coconut, very tasty … but it’s a joke to think it is somehow consistent with what people at during the Paleolithic .. before the dawn of cake pans. Pleistocene ended XXXXX years ago is the most ignorant thing person could say. what are we going to call what comes after. I thought we are in interglacial. when it ends its back to Ice age. oh wait we are going into the destruction of the Earth with run away CO2. 200 or 300 years till we look like Mercury. Note: I think the Greenland Ice Sheet is about to experience a very strong period of growth, leading to declining sea levels. I recently ran across an article from the Australian BOM about the effects of El Niño versus La Niña on their country, and apparently the last La Niña event of 2010-2011 was strong enough to lower sea surface levels 5.5 mm through the rains that fell on Australia alone. It did rain hard over significant areas of Australia in the last few months of 2010 and the first 6 months of 2011, 2012 and 2013. If the rain falls over the eastern dividing range it flows inland. The only exit to the sea for this rain water is the Murray – Darling river system and a lot of this water is used for irrigation. The rest either flows north to the Gulf of Carpenteria or southwest towards the Lake Eyre region. A significant amount of rainfall never leaves inland Australia except by evaporation from predominantly dry inland lakes such as Lake Eyre which normally only fills following heavy rain. Any time I see something that is “dated by proxy,” I have the same problem. Where the conditions at that time identical to the conditions at the time the proxy relationship was established? The Solar System is constantly plowing through different parts of the universe. We “think” we know its makeup, but like everything else in science, every time you turn around, a little “surprise” pops up in observations. The “proxies” used to determine what conditions were 100,000 years ago depend on them having basically unchanged from the ones that exist now. We already know that they were different on the planet, we already know that the Sun isn’t exactly a smooth running engine, and we have no idea what outside influences – as in spatial – might actually have affect the ratios that we see. “Proxies” are useful in that they can give you the sense of what “may” have happened, but they can not accurately tell you facts. Science has been accepting them as if this “guess” is as good as a measurement for far too long. I understand you concern regarding proxies, but nuclear half-life decay is a fundamental law regardless of which part of the cosmos the Solar system is passing though. There are significant other factors that have a significant influence over long time frames. One of these is the change in precesion resulting in which hemisphere has summer at perihelion. When the northern hemisphere is subject to summer at perihelion one could expect significant warming as the land masses subject to moderate to strong insolation are far larger than in the southern hemisphere. Another is continental drift – were Greenland and the other northern land masses even in the same location at the times cited ? I haven’t read the paper so I have no idea if these are considered though I hope they would be.